I remember my first experience with s'mores. 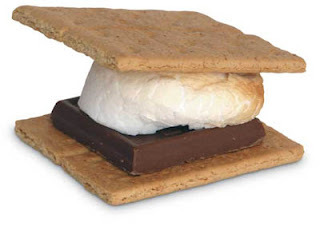 I think I was at a girl guide shindig, and I had eaten one, and then went to ask my mom if she wanted a s'more. She said no. So I went and had another one and she saw me eating it, and asked why I didn't offer her one - I said I asked and she said no. She thought I meant did she want some more dinner. S'mores are delicious!! Although, I've never found a gluten free graham cracker substitute. tres sad.